Thank you Byron! If you are reading this, I know I owe you...! Byron posted this while on a trip to Mexico into a public post box. 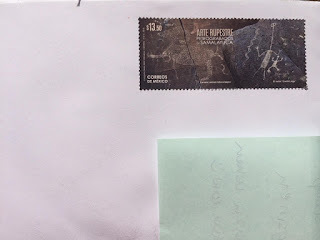 Are no postal markings common for this? Here are two petroglyph panels near Samalayuca, on left is pecked ram, and at right is a figure known as 'man with a long neck'. These images may all be on the Spirit Mask Rock. Issued: December 9 2016.